Brazil nail lacquer shades each feature OPI’s exclusive ProWide™ Brush for the ultimate in application. Liquid Sandnail lacquers should always be worn without top coat. 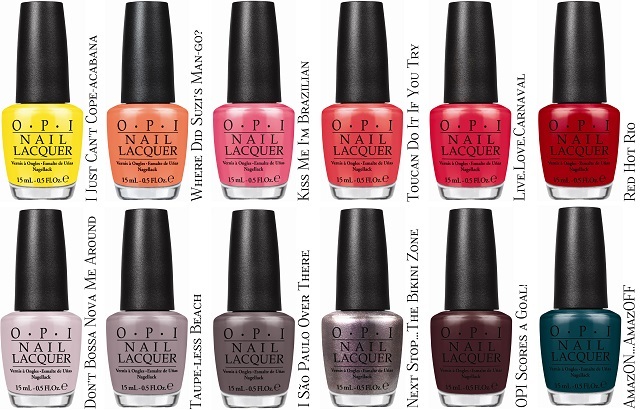 Brazil by OPI will be available in both nail lacquer and GelColorformulas beginning February 5, 2014. Nail lacquers will retail for $9.00 ($10.95 CAN) each at Professional Salons, including Beauty Brands, Beauty First, Chatters, Dillard’s, jcp Salons, Pure Beauty, Regis, Trade Secret, ULTA and ulta.com. Beach Sandies Liquid Sand mini pack will retail for $12.95 ($14.95 CAN). GelColor is an in-salon, professional service only. Prices depend on the salon and range from $28 - $38 for a manicure and $35 - $45 for a pedicure.